In celebration of the 150th year of Confederation, we are trying to visit every Canadian National Park that we can drive to. This is the western portion of that tour. Even with a king-sized bed, I still woke up on the edge of the bed and bent around the lumps of dog. Piper was stretched along the pillows, Leo was at the crook of my knee, and Jack was down by my feet. I was able to extricate myself with only a few grunts of protest from her highness the Piper before I took them outside. Even in the parking lot, the view of the mountains barely kissed by the sun was gorgeous. Too bad I left my camera and phone in the room. Who’d have thought there would be a photo op during a pee break? With the dogs tucked into breakfast, I went to get my breakfast. Ummmm yuck. It always makes me laugh when they refer to it as a “complimentary” breakfast. Complimentary? Really? It’s not rolled into the cost of the room? Is that why there wasn’t any fruit besides some sad-looking apples? 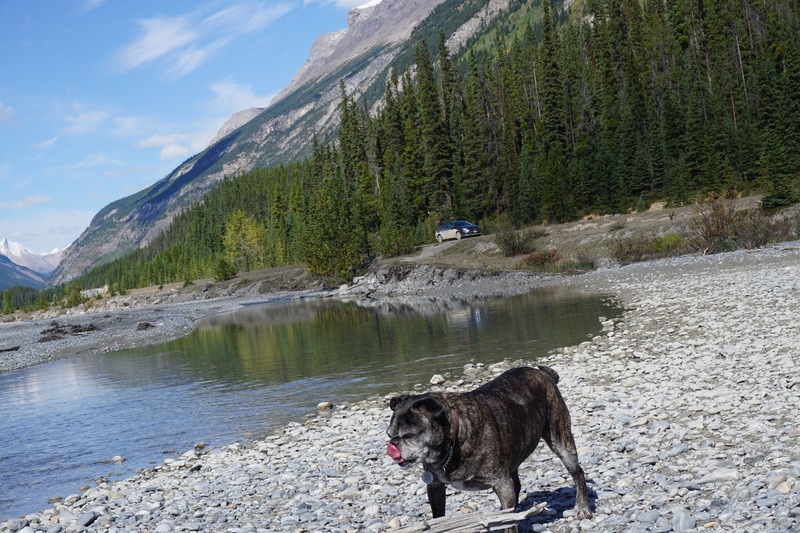 I made due with some soggy eggs and bacon, making sure I got extra for the dogs, before we loaded up the car and once on Highway 16, we headed back into Jasper. There were a few photographic stops on the way of course. The town of Jasper is at the junction of Highway 16 and Highway 93A. I was tempted to stop and wander around town but the sidewalks were remarkably busy and besides, we didn’t drive across the country to look at shops. We came to look at mountains. And elk. And waterfalls. With that in mind, I turned the car south on Highway 93A. Rather I should say I navigated through the inevitable maze of construction zones until I somehow ended up on Highway 93A. 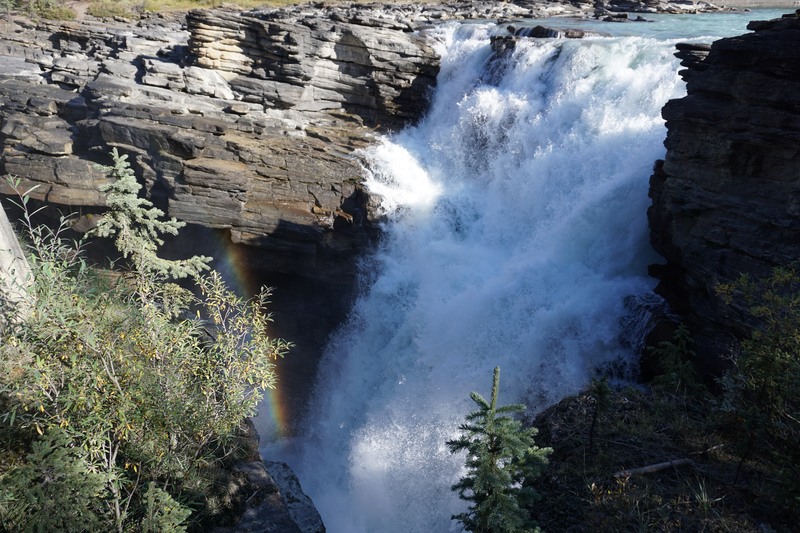 When I saw a sign for Athabasca Falls, you know I stopped. We hadn’t had a proper walk yet and a waterfall seemed the perfect place to stretch our legs. There are a few viewing areas and a set of stairs down to the bottom of the Athabasca Gorge. The stairs are kind of crazy because they go down through a gap in the stone and it would be easy to crack your head off the side. I’ll admit, I was a little irritated with some of the people that were there as they crowded up to us but were upset when the dogs approached them. If you don’t like dogs, don’t stand almost over top of them. I understand wanting to get the perfect photo (believe me I get it) but I’m not camping out here so just chill out a bit. Those were the people that made me want to linger, just to be irritating in a passive-aggressive kind of way but with an entire park ahead of us, we continued south. 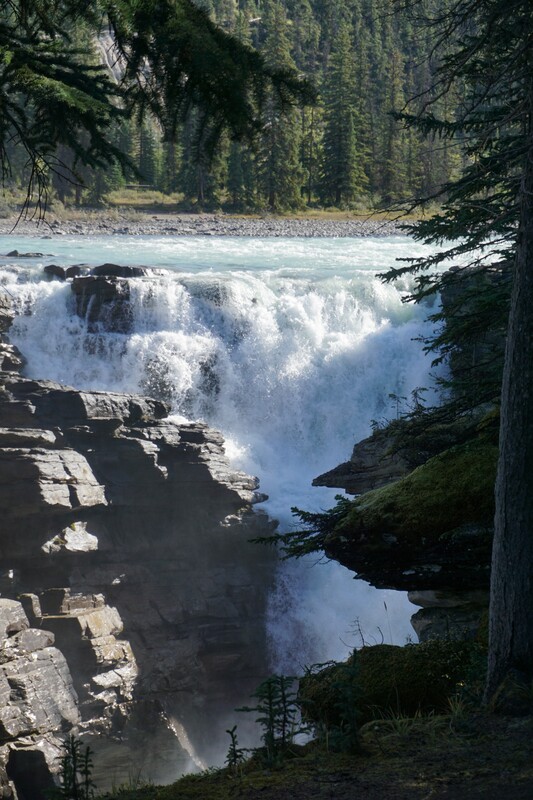 Athabasca Falls. The rainbow is a nice touch. 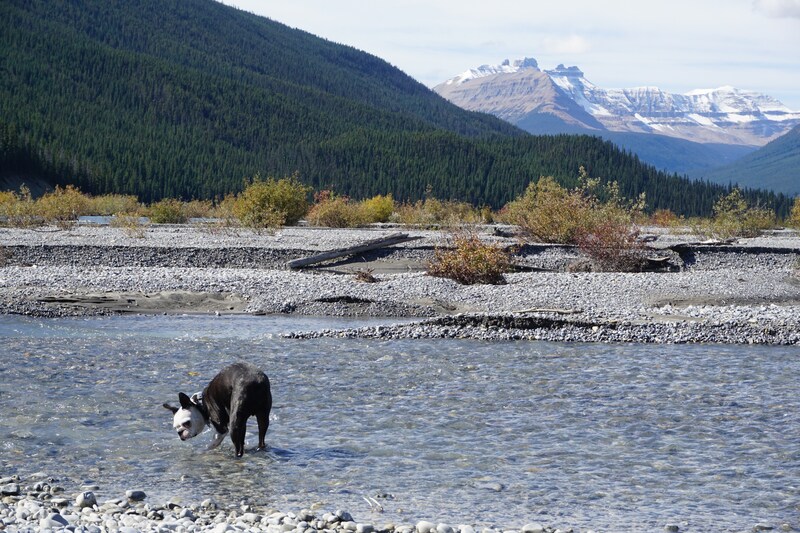 I was tempted to stop at the Columbia Icefield at the south end of the park but seeing as how I had left the dog’s cold weather gear at home and we had not had a chance to adjust to the drop in temperature that I imagined we would experience on a glacier, I decided to pass. The fact that the parking lot that I could see from the road was packed with cars made me think it would be super busy too. A short time later, we crossed into Banff National Park which abuts Jasper National Park. Almost immediately, it seemed like the park was busier. I’m not sure if it was just my imagination but there seemed to be more people at our random photo stops. Let’s face it: when people think of national parks in the mountains, they inevitably think of Banff. 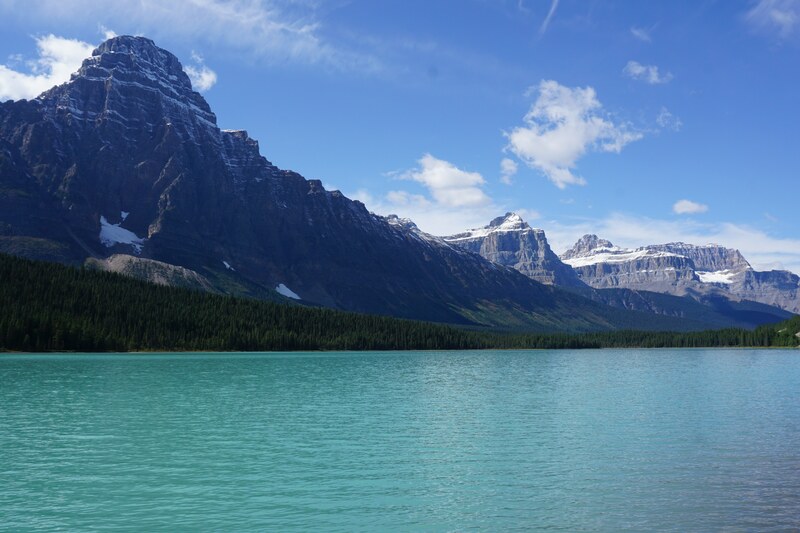 Considering that it is the old national park, the birthplace of the national park system, and is part of UNESCO’s Canadian Rocky Mountain National Heritage, the reputation is deserved. What do you notice first? Jack or the car? We picked our way back down the trail and continued our drive south. 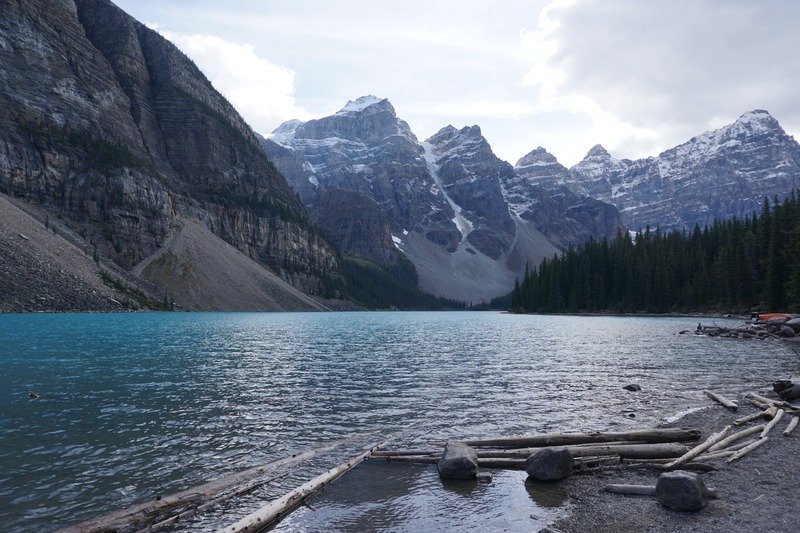 I was tempted to stop at Lake Louise but the sheer number of cars and people was a turn-off so we drove to Moraine Lake instead. 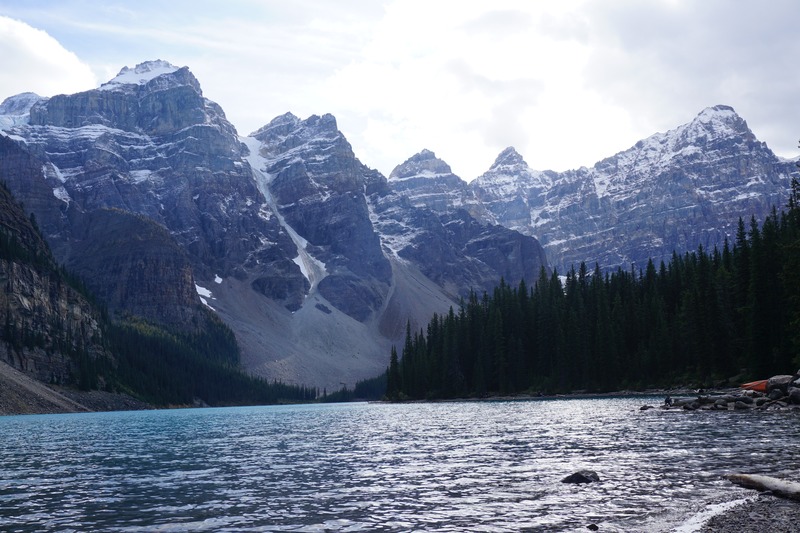 It was crazy busy as well and the first time I drove by the road for Moraine Lake, it was actually closed to vehicles. Fortunately on the way back, they had re-opened it so we were able to see what all the fuss was about. Once I laid eyes on the lake, I understood why so many people were there. It was so popular, there was even a shuttle bus to the lake. We sat on the shore for a little while but being that close to glaciers, it was pretty cool so we wandered back to the car and began to drive out of the parking lot. Then we were flagged down by two women who asked if we could give them a ride back to the main road. I hesitated and looked at the pile of stuff on the front seat and the full back seat. I reluctantly agreed and dumped everything onto the floor behind me as the younger woman climbed into the back with the dogs. They were ecstatic to have someone sitting with them and in short order I saw a phone out for selfies. It turned out to be such an interesting and unexpected meeting. They were grandmother and granddaughter though they looked like they were much closer in age. Grandmother was a massage therapist and granddaughter a butcher. 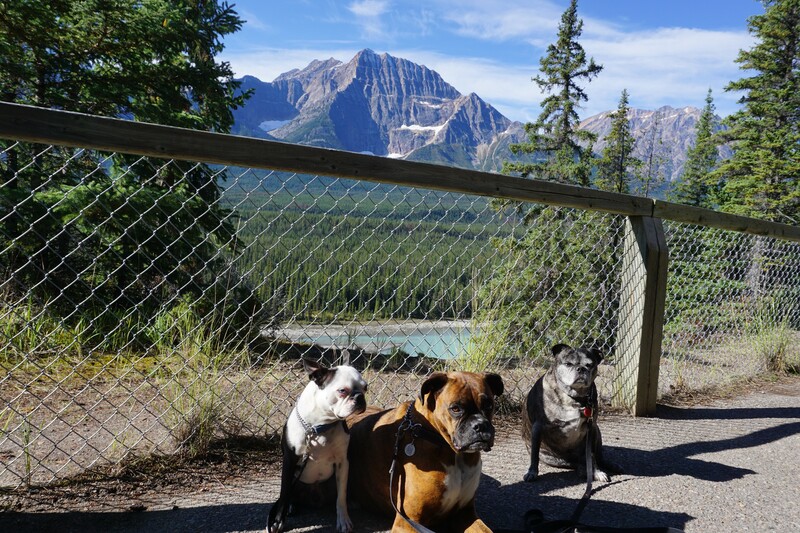 They were from Calgary and granddaughter had gone for a massage but the price she had to pay was a hike. So awesome. Then grandmother told me that she and her husband had an Airbnb and we would be welcome to stay on our way back. Hmmmmmmm. I soon had them at their car and we continued south through the park. 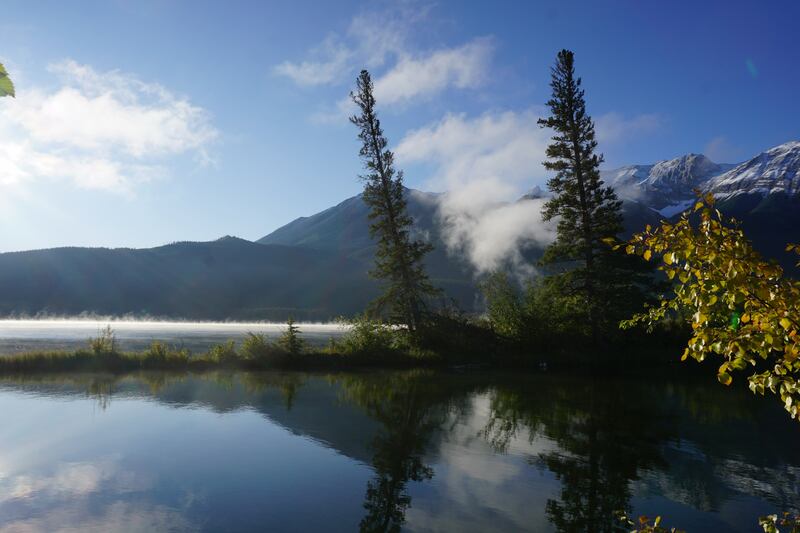 When we arrived in the town of Banff, I started looking for a place to eat and sleep but could not seem to find anything that wasn’t crowded. So I started driving random roads looking for something to catch my eye. A sign for a dog park certainly caught my eye. When I saw that there were lots of other dogs already in the park, I decided to keep Piper on leash. Given all the walking we had done today, the last thing I wanted was for her to go running around with strange dogs. It’s a large park that is almost entirely treed, making it nice and shady with plenty of places for the dogs to run and dig which is exactly what Leo did. Jack waddled around then found himself someone to sit next to while he waited to go. Piper was not happy with me and made no secret with all her huffs and snorts, especially when other dogs came up to her to try and play. I tried to take photos but it was too hard to keep track of everyone, especially since Leo is small enough to disappear behind the large tree trunks. Finally, I was able to get Leo away from his new friends and we climbed back in the car. I had noticed a lot of “No Vacancy” signs as we drove through town and was having no luck on Airbnb for places suitable for dogs. It wasn’t supposed to be as cold as the night before so I figured we’d look for a campsite. Tunnel Mountain was the first campground we came to outside of Banff and luckily, they had sites available. I even decided to splurge on a campfire. Rather than buy wood by the bag like most places, here you go to a woodpile and take as much as you like. Really? Needing to make room in the trunk for the wood, we went to our site to set up first. The sites were large but there was nothing between them and with other dogs nearby, I put the dogs were on their tie-out and rolled out their outdoor blanket which I topped with their heavier blankets. Piper was quite content to curl up and rest while the boys supervised me setting up the site. Leo kept trying to sneak into the tent every time I turned around. Little monkey. With that taken care of, I loaded the dogs back in the car and we went to get our wood. Sure enough it was a massive pile and I eagerly loaded way more into the trunk than I thought I would need but whatever I didn’t burn would be left for the next camper. People make fun of me for keeping a hatchet in my trunk but who’s laughing now? I had wood split into kindling in no time and that was when I discovered a slight flaw in my plan for a fire: I had nothing for tinder. Crud. I went through my growing accumulation of receipts and park newsletters and whatever else I could burn and gathered a small pile of crumpled paper under the kindling. When that looked like it may not fuel the conflagration, I poured on some of the methylated spirits that I use for my camp stove. Well let me tell you, THAT got the fire going. It scared the dogs a little but they were soon back on the blanket and soaking up the heat. In fact, they all curled up as close to the fire and dozed off. It had been a tiring day for them after all. After pouring out their dinner, I set about making mine: the now standard ramen noodles with dehydrated beef and vegetables. Once I had washed and put everything away and doused the flames, we piled into the tent. I tried to make sure everyone would be warm enough in their blankets, but I still had Leo burrow into the bottom of my sleeping bag and Piper squeeze in next to me. Eventually I unzipped my bag so that Piper thought she was in with me and pulled a blanket up around her so we could cuddle. Leo got tired of being crammed near my feet and climbed out. Then back in. Then back out. When I tried wrapping him in a blanket, he seemed comfortable then he extricated himself and spent the next five minutes forming it into a nest. Jack piled up his favourite blanket and soon was snoring away, oblivious to Leo’s blanket shenanigans. Several highways lead through the park, however with the closest international airport in Calgary, the Trans-Canada Highway 1 is likely the easiest east/west road to take while Highway 93 runs north/south. As the park is open year-round, there are plenty of things to do, from hiking, mountain biking, geocaching, fishing to skiing, snowshoeing, and ice climbing. Canoes and kayaks are available for rent but sudden changes in wind and temperature means it’s a good idea to stay close to the shore just in case of capsizing. 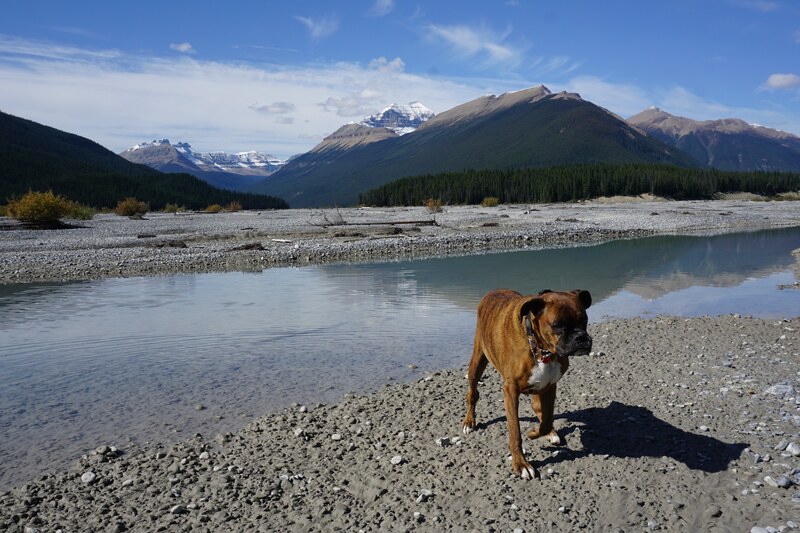 Like Jasper, Banff also has a hot spring, Upper Hot Springs, which are open all year. There are serviced, unserviced, and backcountry camping sites available. If you really want to rough it, there are shelters, alpine huts, and backcountry lodges. 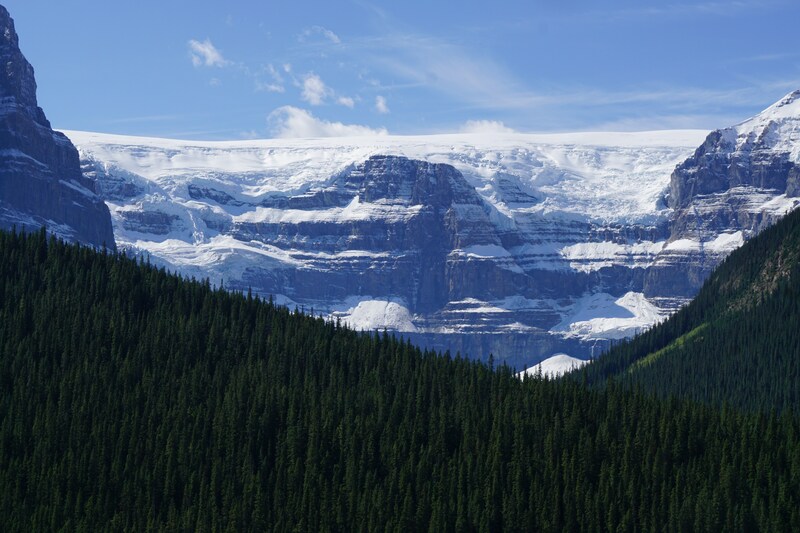 Winter camping sites can be found at Tunnel Mountain and Lake Louise. 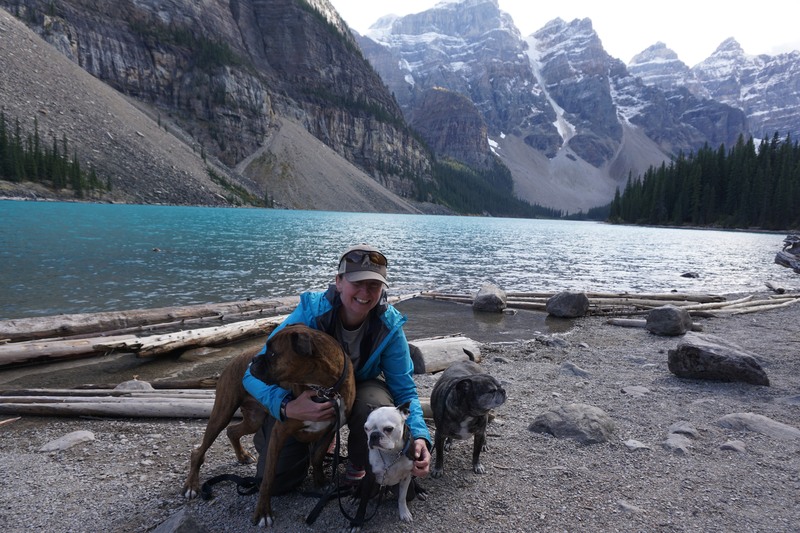 If you want to sleep in comfort, there are several hotels and B & B’s in Banff and Lake Louise. Banff has many different restaurants to choose from. I’m not sure what food is available in Lake Louise. 10 response to "The Big B"
Beautiful country! Loved all of your pictures. The waterfall is breathtaking. Sounds like another wonderful day! Thanks for sharing. These are probably places I’ll never go to in person, but I love seeing them through your blog. You take amazing pictures. Thank you so much. I appreciate you taking the time to read and I’m glad you’re enjoying the photos. There’s more to come. Thank you. He certainly is much better looking than the eye sore in the background. Great photos! 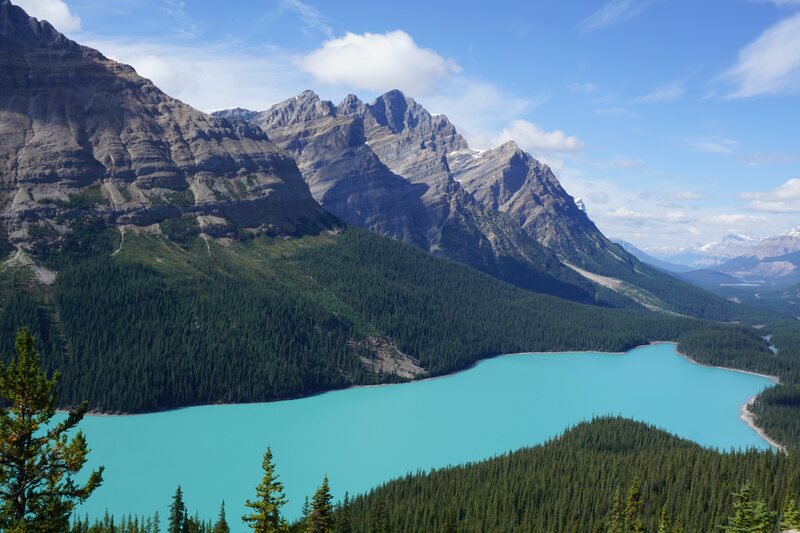 I loved the Canadian Rockies, especially that view of Peyto Lake. Thank you. 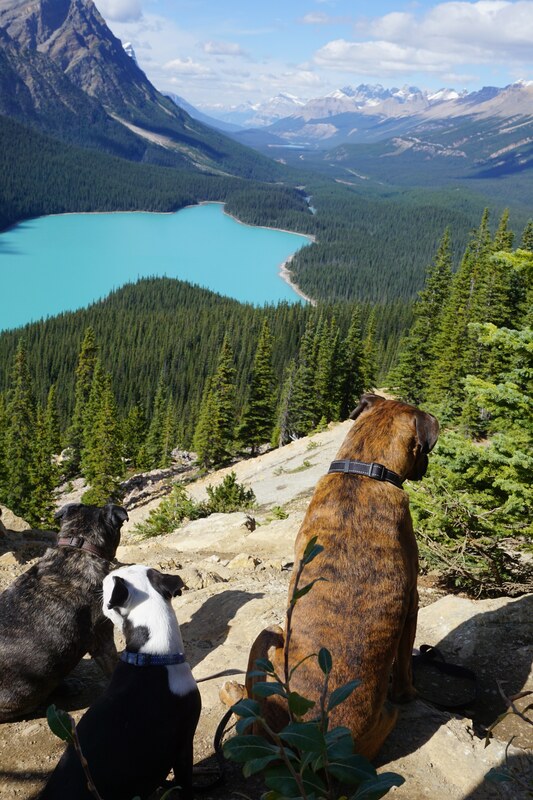 That was the first time I had ever seen Peyto Lake. Wow is all I have to say. Yucky breakfast notwithstanding, I’d say it was worth it from these photos! Absolutely beautiful. I think it was a fair trade. 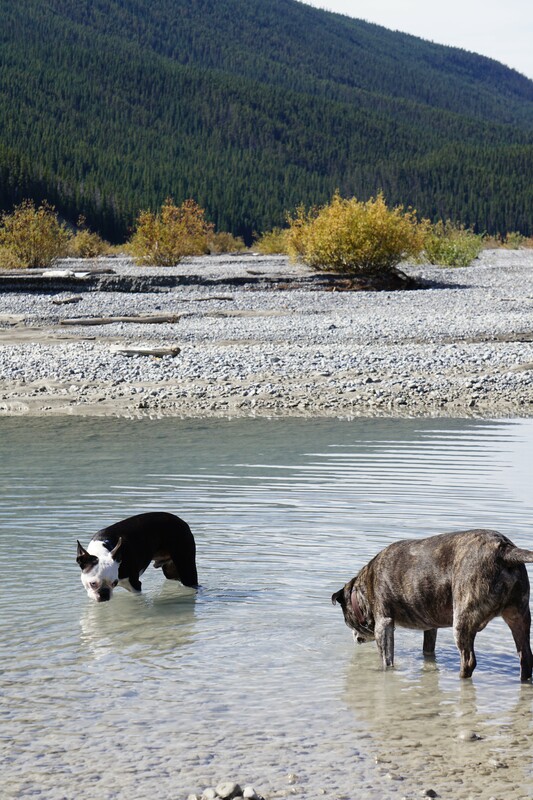 I would love to visit Banff with Xena someday. Such a magnificent place! You both would love it. It really is a special kind of wonderful and with six national parks all in such a small area, there are so many different places to visit.